This three inch pot of Mullein is ready to go. 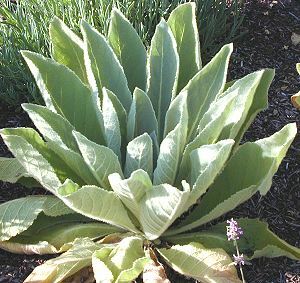 Planted in the spring Mullein will grow into a striking floret like the one above. Tall flower spikes will emerge, and flowers will open from the bottom to the top over a period of about a month. The Mullein will then set seed and die. Seed heads left behind provide food for birds and will scatter to the ground to provide the next year's crop. 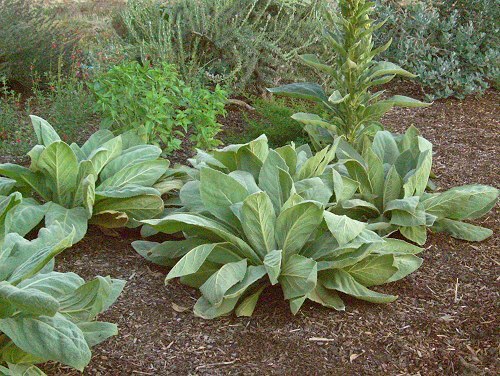 Planted in the fall, Mullein will grow a bit and then wait for next spring to expand and flower. 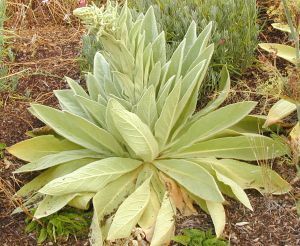 The picture at the bottom shows how Mullein self-sowed itself one fall in our garden. 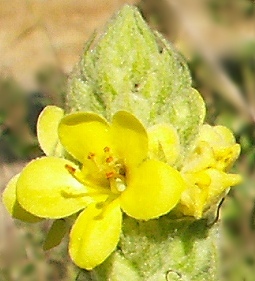 It is not uncommon to have both flowering Mulleins and new Mullein plants in the same area. This plant is sometimes available in plug trays. These trays hold 128 of all the same plant. They are a great low cost way to fill a lot of space. Each cell is 3/4 of inch by an inch. 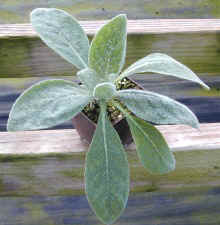 Check here to see if Mullein Plug Trays are available.